The New York Times ran an interesting editorial last week about Colorado entrepreneur Aaron Million’s plans to build a private water pipeline, running 560 miles from Wyoming’s Flaming Gorge Reservoir to Denver and other cities on Colorado’s Front Range. From a legal perspective, the water being pumped is there for the taking, even if it sounds a bit unfair for a private developer to take free water out of a river and then sell it to thirsty municipalities. But the project itself would be an environmental disaster, leaving the Green River basin with seriously reduced flows for fish and wildlife, not to mention boaters, farmers, and fishermen. The fact that it’s getting even halfway-serious consideration shows just how worried the Front Range cities in Colorado are about meeting their future water needs. And according to a new study by Western Resource Advocates, the Front Range will have even more reason to worry if oil-shale development ever takes off in Western Colorado. The process of turning shale rock into usable oil involves a huge amount of water (somewhere between one and four units of water per unit of oil produced), a fact that environmental groups use as an argument for why oil shale is untenable. Still, the water-intensity of the oil-shale process is unlikely to stop oil-shale development if the Bureau of Land Management decides to grant the appropriate leases. That’s because energy companies interested in oil shale have been slowly accumulating water rights in Western Colorado—some of them original claims that the energy companies made back in the 1960s, some of them purchased more recently from area farmers. Many of these rights—especially the agricultural water rights—are senior to the water rights that allow Front Range cities to pump water out of the Colorado basin into their municipal water systems. And when there’s not enough water to go around, Colorado, like other Western states, allocates water on the basis of seniority. So this means that if oil shale ever really got going, the Front Range could be in serious trouble. How much trouble? 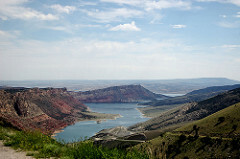 Western Resource Advocates calculates that energy companies hold the right to divert more than 7.2 million acre-feet per year from the Colorado River and its tributaries in Western Colorado. That’s more than the state’s entire allocation under the Colorado River Compact, the 1922 agreement that governs the use of the river’s water. This doesn’t mean that oil-shale development would completely dry out the Front Range, because not all energy-company water rights are senior to the water rights of various municipalities. But it gives a rough idea for just how much of a water-squeeze the state of Colorado would find itself in if it had to support an oil-shale industry. And it would take more than a pipeline from Wyoming to alleviate the situation.